While some people have negatively associated menopause with becoming fat, this is not exactly the truth. There are changes during menopause that can lead to some weight gain but this is natural and normal. It is generally when you consume excessive calories combined with a lack of exercise that you will gain a great deal of weight, leading to a host of potential health problems. In Britain, overweight and obesity have significantly increased in the last decade. Menopause, however, is not to blame but poor lifestyle factors such as diet are the key issues that impact weight. 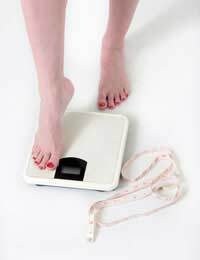 As we age, our decrease in muscle tissue and decrease in metabolism can cause us to gain weight. Also, busy lives, less exercise and an abundance of comfort foods such as sweets and crisps can all lead to weight gain, particularly around the midsection. Some women find that the mood swings and emotional stress of menopause can lead them to eat more, particularly as a crutch for their emotional challenges. When things get stressful, you might reach for a bar of chocolate – despite not truly being hungry – simply to try to ease your worries. Ultimately, however, this only triggers a seemingly never-ending cycle as you start to worry about your weight and then end up eating more as a way to deal with that worry as well as your symptoms of menopause. It can help to see your doctor or a dietitian, both of whom can provide sensible advice on your diet and how to handle your emotional ties to food or your challenges in maintaining a healthy body weight after menopause. There is a great deal of misinformation available regarding diet, weight loss and menopause, which means you need to speak to a qualified professional about the safest and healthiest way to manage your weight after menopause. For most overweight women, a 500 kcal reduction in their food and drink choices each day will help them lose weight, assuming they were previously maintaining their weight. The aim is to create a caloric deficit through diet as well as through exercise. Exercise after menopause is important primarily for its bone-building properties in women's health. For this reason, weight-bearing exercises and walking can be helpful. Try to also perform cardiovascular exercise three times a week for approximately twenty minutes. This can improve heart health after menopause. Not only that, but it can help you with creating a caloric deficit if you need to lose weight. Better still, exercise has many mood-enhancing benefits. This can be particularly helpful if you are suffering from mood swings during the menopausal transition and also into the postmenopause stage. You might want to buddy up with a friend to help keep your exercise routine consistent and enjoyable. For some women, menopause will bring with it the challenge to accept that they don't have the body they did in their twenties, thirties or forties. It's natural to expect that your body will look different as you continue to age. Some weight gain is normal and your muscle to fat ratio will similarly change as you age. If you eat a nutritionally balanced diet and include regular exercise, you will likely be able to maintain a weight that is normal for you and satisfactory to your doctor or other health care provider. Fad diets and starvation tactics will only harm your body and could exacerbate menopause symptoms. Accepting your body is beneficial to some degree if you have already reached a healthy body weight. Those who are overweight or obese should speak to their doctors about safer ways to lose weight, prevent weight gain and maintain the weight loss after menopause. You can prevent excessive weight gain and manage your weight after menopause through a healthy diet and exercise, allowing you to feel and look your best.